Since everyone enjoyed our employee profiles during Women’s History Month, we are going to keep going, but first, it’s time for the man of the hour, the king of the hill, our co-founder, and fearless leader Phil Guzie to take the stage and share with us how Precision Images came to be, and how he’s grown and maintained such a successful business. 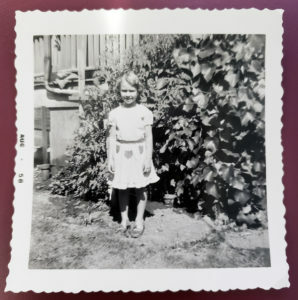 The history of Precision Images is a classic startup tale of struggle, of visionary drive, and of the power of family, actual and developed, that creates the glue that keeps Precision Images humming along nearly three decades later. It’s a story full of excitement, hard work and long hours, and the rewards for work well done. How did you get into printing in the first place, and why? In the summer of my freshman year of college I returned home and was hired by a local blueprint company as a temporary printer. The position was only for the summer generating blueprints for the Veteran’s Hospital construction near OHSU. Upon completion of this temporary print job that firm offered me a variety of other positions that allowed me to continue school and stay employed. At the time I was working a split major of Sports Medicine and Business. I eventually dropped the Sports Medicine and focused on business knowing I always wanted to be in business for myself. I didn’t really have a field direction and was learning so much about the printing industry I decided to focus my business desires towards this field. 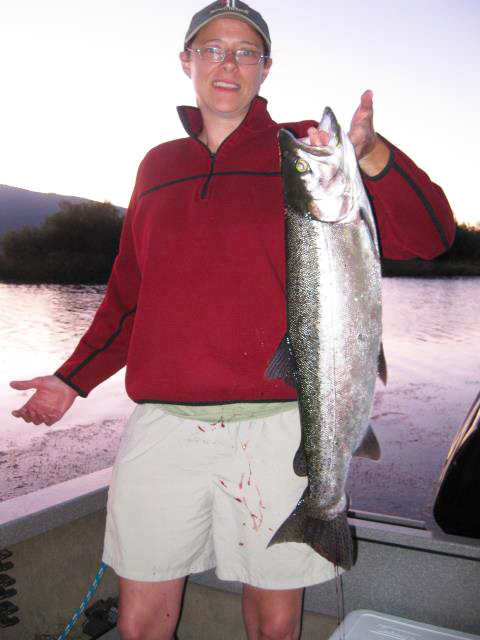 Over time I was able to work in every department for that same company including outside sales, production management and eventually rising to the position of General Manager for their Oregon operations. In late 1991, a very good client of mine introduced me to the owner of a competitive printer that he had heard was looking to sell his business. Over the fall we negotiated the sale and on January 17, 1992 Precision Images was born. I was born in Minneapolis, Minnesota where much of my aunts, uncles and cousins remain. 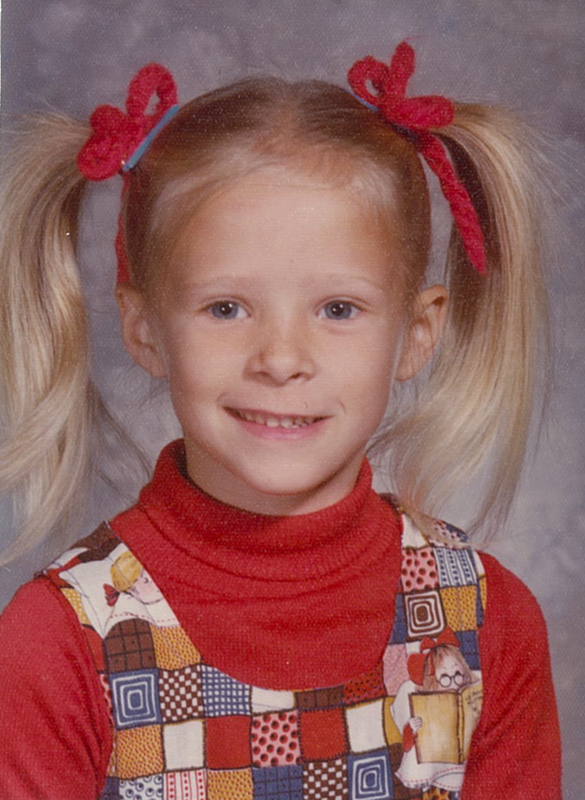 When I was 3 my father was transferred to Boise Idaho as a director for Boise Cascade. My mother, a social worker, began the social work department at Boise State University. In 1970, my father was transferred once again, this time to Portland where we’ve remained ever since. I attended Duniway Grade and Cleveland High Schools. College at Linfield and Portland State. What made you and Don partner up and set out on your own? 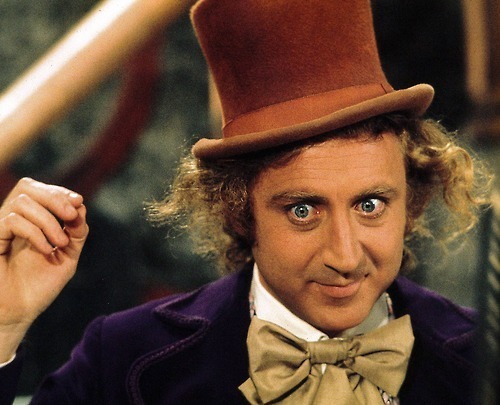 At the beginning of my career in this industry Don was a salesman for the same firm. He and I both moved up the corporate ladder until he reached the position NW President based out of Seattle and I was running Oregon based out of Portland. Working together for a few years as such, we both became disenchanted with a corporate head quarters that siphoned the profits from the Northwest and used them to prop up non-performing out of state operations while failing to reward the hard work put forth by our Northwest staff. After a few years attempting to change this behavior, we came to the conclusion we needed to set out on our own. We decided rather than start from scratch we needed a running start. We needed to purchase a small firm in the industry that we could grow. It was decided that if the opportunity arose in the Seattle area my family would relocate north. The like was decided about Don’s family if a Portland opportunity arose. As luck we have it, for me, the first opportunity that surfaced was Western Images Systems in Portland. The firm that we successfully purchased in the winter of 1991/1992. What was PI like in the early days? Our first days of Precision Images was a whirlwind. Don, I and our first 4 employees did everything needed to run a small blueprint company. We had many long days and weekends as we struggled to keep up. We quickly learned that the Portland marketplace loves a startup. The support we received from the local A/E/C community was tremendous. How has PI changed? How has printing changed since ‘92? 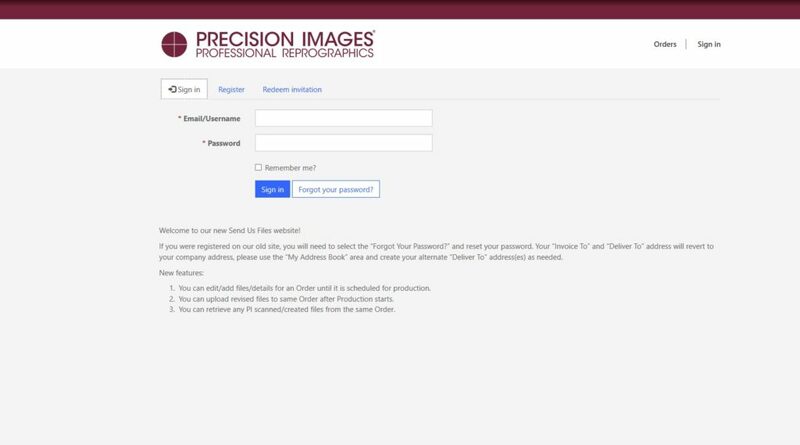 Over our 27 years of operations much has changed for not only Precision Images but for the reprographic industry as a whole. Prior to the 2007-2009 Great Recession we had grown to 4 locations and nearly 80 employees. We were still nearly 100% focused on construction and architectural printing. The recession hit everyone in the development world hard as projects where moth balled, and funding was non-existent. We were forced, as were many firms, to contract to what would become the new norm. As we exited the recession and development and construction began to take root once again our industry was faced with a new challenge, technology. 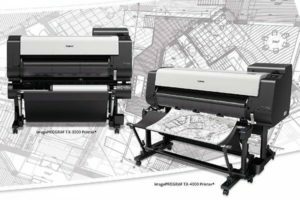 With collaboration software’s, BIM, 3D design and the introduction of high-powered tablet computing, the need for paper documents was greatly reduced. Most in our industry experienced decreases in construction printing of over 50%. Diversification became the charge for any firm in our industry that wished to stay relevant in the future. Our investments became focused on signage, way finding and interior décor generating equipment. Today, although services focused on the A/E/C community still represent 60% of our revenue, 40% of our services and products are consumed by a diverse client base outside the development community. This percentage grows on a monthly basis as we become known in the community for more than just a blueprinting company. Most of the team, December 2018. PI has a number of employees that you worked with before PI, how did you convince them to come along with you? Athletics and team sports have been a part of my life since I can remember. That experience taught me that teamwork is essential for mutual success. To have successful teamwork a mutual respect for all must exist fostered by thoughtful coaching. I’d like to believe that my management style exemplifies this. When I decided to venture out on my own, I discussed my plans with many of my key players that currently worked with me. Although some preferred to remain with the security that a large entity provides, I was lucky enough to have most of my key players show enough confidence in Don & myself to take the leap of faith towards our new venture. As we currently have 2 individuals still here from day 1, many of our staff having over 10 years’ experience and more than a handful of 20+ years veterans, I believe we successfully fostered a healthy and rewarding work environment. Tell us about the team you’ve built, and why people choose to stay so long? (It’s kind of unheard of nowadays). As mentioned previously, I believe in a team environment and little managerial hierarchy. I believe this gives the individual a strong sense of self-worth and therefore creates highly skilled, highly motivated and committed workforce. Respect of the individual and freedom from obsessive managerial oversight, I believe, creates an environment that people enjoy and find rewarding. Training, hiring and firing are all expensive endeavors. So much of that can be eliminated by creating a positive and rewarding work environment. Many companies frown on family members working together, why does this work so well at PI? Nepotism runs deep in Precision Images. Much as what was required in the farming communities of the 19th and early 20th centuries, it took families to provide the necessary labor to keep the family business running. In the early days of Precision Images, we certainly had the alligator mouth and canary rear end issue. We simple marketed over our capacity to produce. Dragging family members in was the fastest way to acquire “cheap” and immediate labor. Our spouses and children all put in time running blueprints, binding sets, spotting negatives and making deliveries. 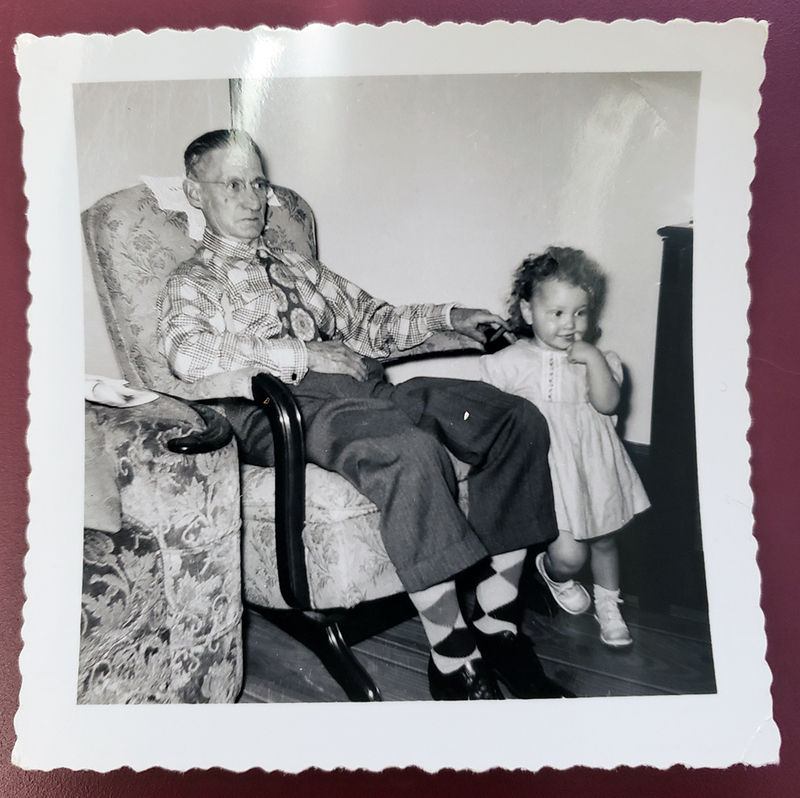 Upon reaching adulthood and finishing schooling, both Don’s daughter, Erica, and son, Josh, as well as my daughter, Suzi, chose to return to the family business as part of their career path. All three are still here today and we’ve added Erica’s husband Tom to the team. Watch out grand children! Your daughter is the GM, what’s it been like to watch her grow in the company and role? As a child Suzi was drug by her pig tails into the office in times of large workloads. It’s amazing what you can get a kid to do for a little Baskin & Robbins ice cream. I think a lot of her work ethic came from those early days. 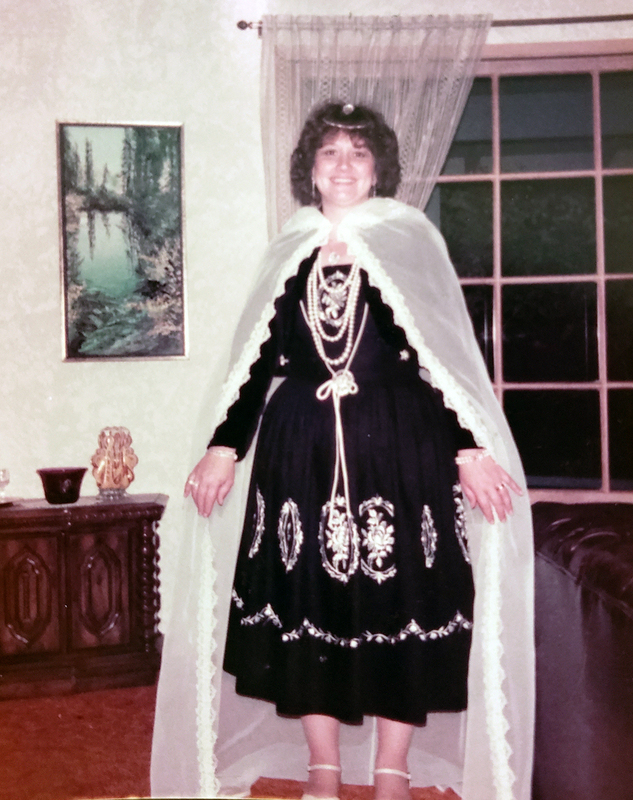 As most kids in their teenage years do, Suzi wanted to work at the local pizza parlor, which she did. After so many young years helping out at Precision, I could understand her desire to be somewhere other than in the family business. Being a smart kid with a strong work ethic she moved up quickly and became a branch manager for Round Table Pizza in just a few short years. Making a name for herself there she was recruited by Pizza Hut to work as a manager in non-performing locations. To my benefit, the grind of being a “turn around” specialist was more than Suzi bargained for and she was quickly burning out. At that time, we were experiencing some pretty rapid growth and we needed someone to manage our newly opened Lake Oswego facility. Suzi was a perfect fit and agreed to take on that role and return to Precision Images as a permanent employee. 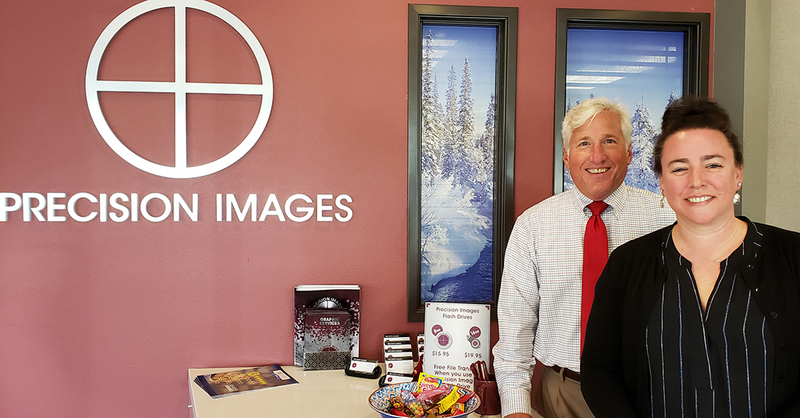 Since that time Suzi has moved through just about every department within Precision Images, all with equal success. I am very proud of her and look forward to watching her, after my retirement, leading our family business into its next chapter. When you retire will PI stay in the family, go up for sale, or will you make it a co-op like Bob’s Red Mill? The current train of thought is for Suzi to purchase the business from me when I retire. Everything of course is subject to change, especially as my retirement is several years away. As we get closer to that time a transition plan will be laid out that meets Suzi’s goals, allows me to un-clip from daily operations and offers the best chance for the future success of the company. With the longevity of most our staff, a co-op could certainly work but I would want to insure a status of Women Owned Business Entity, WMBE, could be achieved and maintained. There are very few WMBE business’ in our industry and being one could provide a number of benefits to Suzi and our business operations. I love being creative, especially with a team of creative people. There’s no substitute for the charge I get when faced with a difficult situation that, through group effort and creative brainstorming, a perfect, unexpected solution is discovered. From a young age I wanted to be a business person. The field didn’t really matter to me, but I knew I wanted to run my own show. As luck would have it, I stumbled into Reprographics and opportunities continued to present themselves to me. Maybe just dumb luck. Precision Images allows me to be a businessman, be creative, work with people I enjoy and be fulfilled. I consider myself to be pretty lucky. To celebrate Women’s History Month, we are highlighting some of the amazing women that make things happen here at Precision Images. Printing has historically been a male dominated field, so it might be a surprise to learn the roles women hold here at Precision Images. This is our 4th installment of interviews with the women of Precision Images, today we are celebrating, aka questioning, Heather Brower, as Assistant Production Manager she insures our high-quality standards and fast turnaround are second to none. She’s been here since day 1, coming along with founder’s Phil and Don when they started out. I have been the Assistant Production Manager since December 15, 2017. I am the liaison between the customer and production technicians and responsible for quality control. I distribute incoming job requests to the different departments, field questions from the production staff and if necessary, contact the client, field questions from our clients, provide quotes for upcoming projects, quality control and package outgoing products for delivery or shipping and maintain communication with our dispatcher so we can meet deadlines. I help track incoming supply orders and pull stock from the warehouse for those clients whom utilize that service. There is a LOT of walking involved! At times I can be found at the front counter working through a special request but mostly Amanda Grasseschi and Mary Justice have that covered and do an excellent job! It can get pretty intense at times and I am fortunate to work with a team of people who are well trained and dedicated. 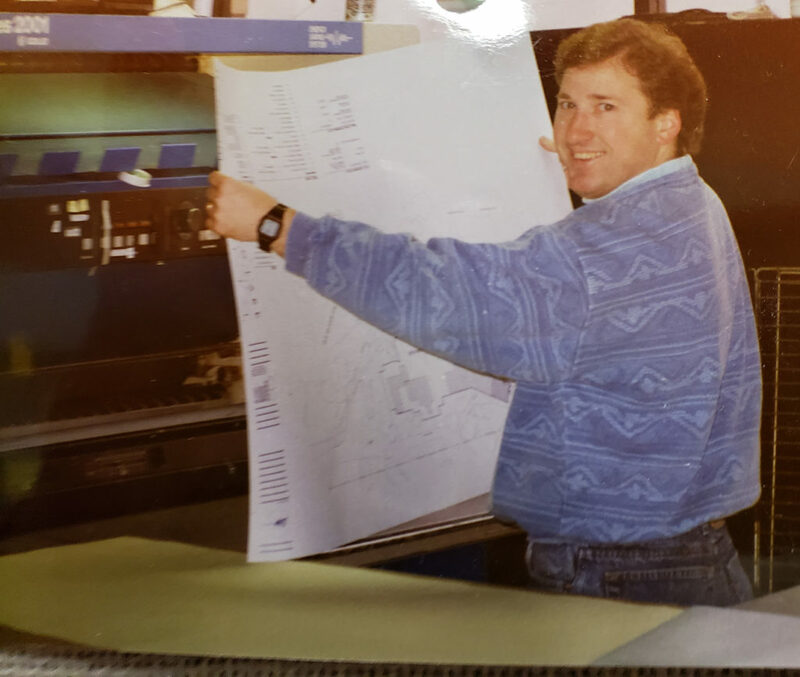 In 1988 I started as a delivery driver in a competing firm (working with Phil and Don) and would often work after hours in production, thus my introduction to the World of printing. In 1991 I was asked to join the team of the new company they were founding and in 1992 that became a reality. It was exciting to be a part of the business dream and experience the immediate success of hard work and determination. Around 1996 I worked for a short spell at a different firm but came back in 1997 and by 1988 I was elevated to manager of our Oak Street/Washington Street locations. I held that position for 19 years before moving to the big house. 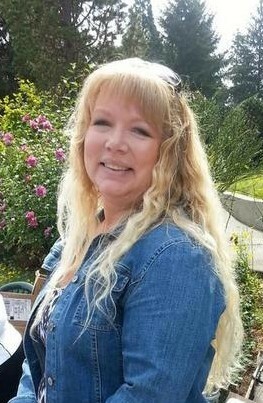 That said, I am on version Heather 2.0 so I cede my title of “longest employee” to the wonderful Patti Hanson. Favorite things about working at PI? Favorite memory? I love that we are a small company and that we ALL matter equally as we can’t be successful without all the cogs in the wheel. My favorite memories are of building relationships with my coworkers be it company gatherings or just day to day interaction. I cannot fail to mention bringing my pup (Niki) to work with me for 10 years, or the epic rubber band battles that have been waged throughout the story of Precision Images. I absolutely loved having the face to face interaction with clients in the smaller branch environment. Most industries are historically male dominated, so printing isn’t unique in that experience. I mean sure, there have been instances over the past 31 years that have been uncomfortable and have only served to stoke self-determination. I don’t set the standard of my excellence based anyone’s opinion and do appreciate all I have learned from everyone who has contributed to my career. Printing can be a very intense industry at times, but it is fun rising to the challenge! The digital age really upped the ante on what we are capable of producing and the speed with which we can turn around products. The lessening in demand for large quantities of construction sets really cut into our backbone and has altered the shape of the company. We were once four locations and have consolidated back into the original one…you could say we are more streamlined now. I think it is going to be fun as we continue to advance more into visual media. We can produce some pretty amazing items and are constantly pushing ourselves to think outside the box. It is going to be an interesting journey as we march into the future! Favorite food? Favorite band or music? Favorite movie? Favorite book? I have no favorites! I am partial to well thought out dishes prepared with a lot of heart (bonus points for spicy). I enjoy music that makes me feel happy and want to move around but appreciate many genres, it all depends on the mood. I am not a horror movie fan but enjoy a good scary book but again have no favorites, I am pretty open. 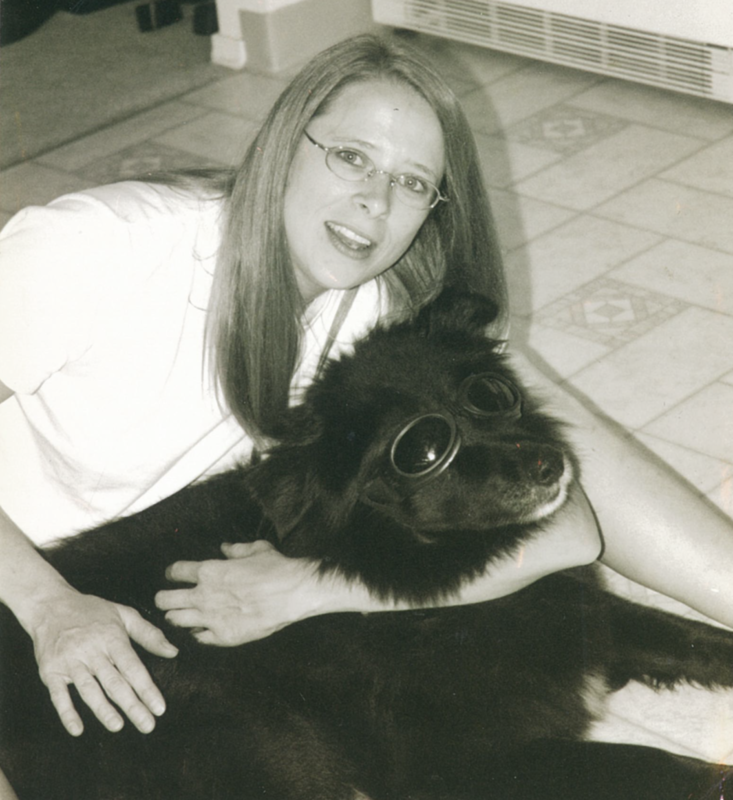 Meet Patti, a vital part of Precision Images’ since Day 1! 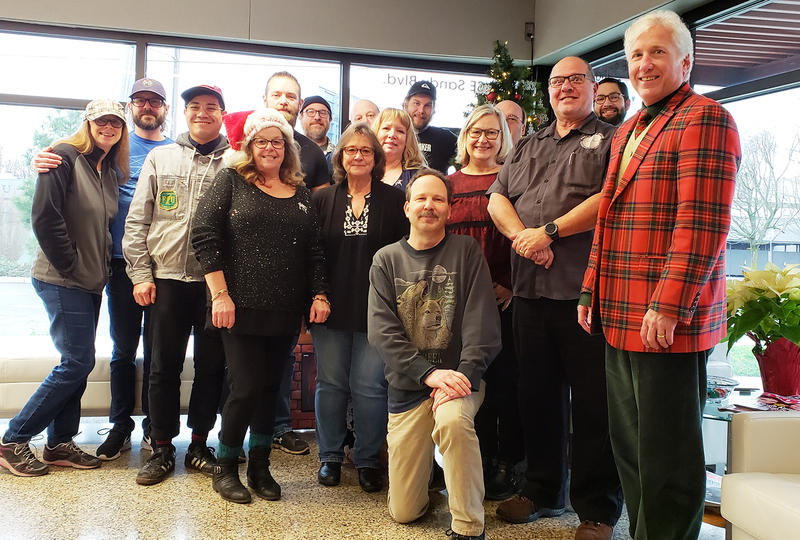 A while back, while trying to figure out who was Precision Images’ longest serving employee, Patti Hanson and Heather Brower (who you’ll meet in the next few weeks) each insisted the other had been here longer. 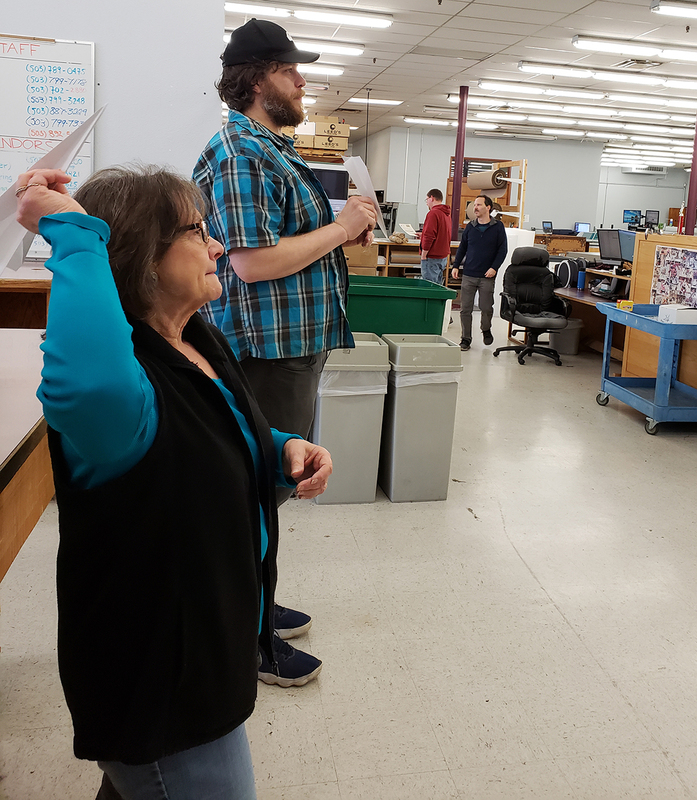 Here’s some amazing facts, Patti’s husband retired from Precision Images a few years ago, and her son Chris is our Production Manager. Patti was recruited to join Precision Images from it’s very beginning by co-founder Don Bitterman. She has a smile that lights up a room, and mad paper airplane skills. Patti, playing for keeps during “Have fun at work day”. She’s a paper airplane shark. 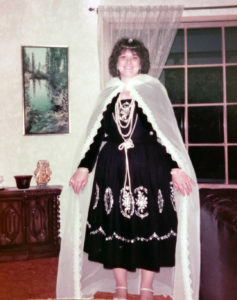 Patti in the 1980s, dressed as the Frog Princess for a Halloween Party. My husband and I both worked for the same reprographic company as founding partners Phil & Don and followed them into their new business. I started with PI about six months after they opened their doors in 1992. Hard to choose a favorite. I’ve experienced so much and have been given so many opportunities for growth, both professionally and personally. I have enjoyed freedom to create; to learn and apply that knowledge for the benefit of PI as well as myself. I still feel pride in myself, if I may be allowed, for the time and effort invested in studying and passing the exam for certification as Construction Document Technologist, offered through the Construction Specifications Institute (CSI). Favorite memory: engaging in a little office romance that grew into a marriage that has lasted almost 42 years. My husband left the printing industry to start his own construction business. Future favorite memory: working with our son, who also has his own extensive history with PI. 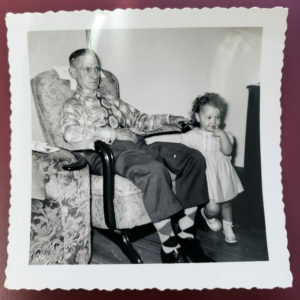 Little Patti with her grandfather. I don’t think there is a woman out there who hasn’t had some kind of issue in the work place, and I don’t think the printing industry, generally speaking, is any different from any other industry. By that I mean, wherever you have multiple people, there will be a rainbow of opinions, beliefs and issues. At times during my career I have faced some attitudes that were hard to ignore, but they were few and far between. I am fortunate to have not experienced the hardship and heartache so many other women have endured. I can truthfully say the years spent at PI have been the best. Phil & Don have fostered an environment that is respectful and inclusive. Employees are treated fairly as individuals and, as all companies must have policies and procedures (for the good of all), flexibility is allowed. We are a team, we are a family (bickering included!). Tremendously! When I started at the tender age of 18, 16mm & 35mm microfilm, aperture cards and microfiche were the predominate methods of file storage. 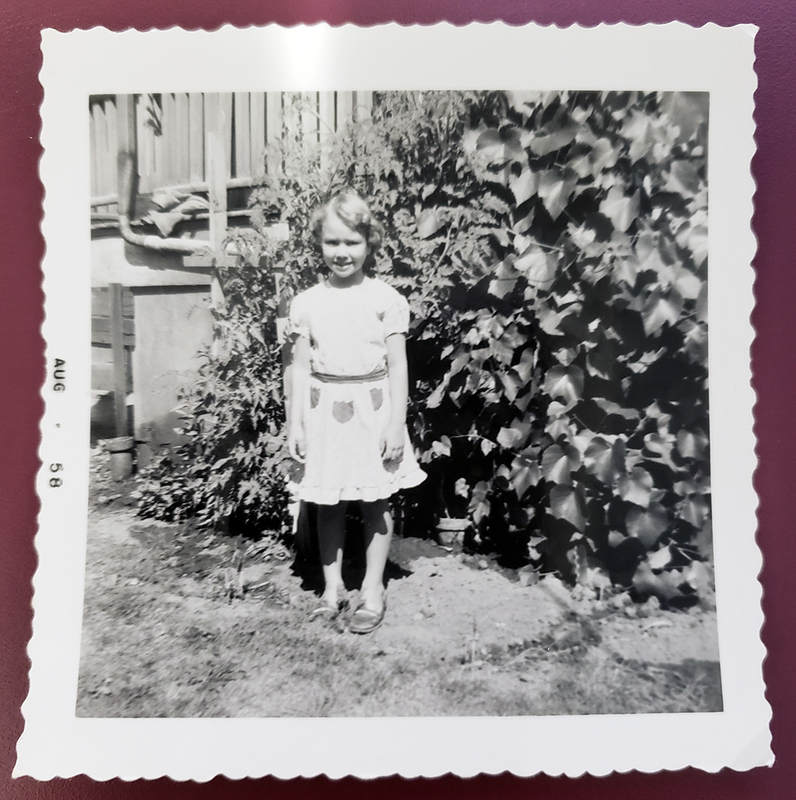 Black & white prints could be made from the film or blueline (diazo) copies were made from translucent originals (vellum/sepia). We then progressed to black & white printing without the smelly ammonia of ‘blueprinting’. Machines became faster, sharper, and with more color. Color opened the door to serving more diverse customer groups in addition to more opportunities within our traditional customer base, Architects/Engineers/Contractors. Gone are the days when we printed 100+ sets of 300+ drawings for bidding contractors, shipping them all over the US and in some cases, the world. The Document Library is a little quieter these days with digital files handled through online plan rooms or directly from person to person. However, as with the industry, our jobs and responsibilities have continued to evolve and advance. There is no standing still! Patti at 7 years old. I can’t pin down one favorite of anything. There are many things that bring enjoyment. Favorite food: (almost) anything spicy. If there is Tapatio hot sauce on it or jalapenos or pepperoni in it, it has to be good! Favorite band/music: I listen to several different types of music (I station-surf in the car). Favorite bands have included The Beatles, Paul Revere & the Raiders, Chicago, Journey, The Police / Sting, Genesis / Phil Collins. Favorite movie: The Breakfast Club, A Star is Born (1976-Streisand/Kristofferson), Jesse Stone series. Favorite book: The Bible, early Stephen King. Hmmm…..a bit of conflict there. 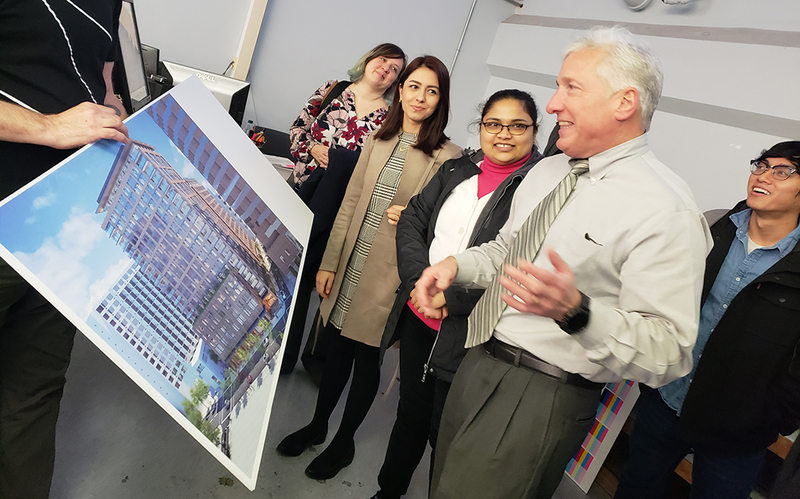 IF 11x 17 Poster FINAL – Printable version Precision Images is proud to be a sponsor of the 2019 Industry Forum from CSI (aka Construction Specification Institute)! We will be taking part in the “Speed Education” segment at this year’s forum to teach people about all the various printing material options and how to find the best one for each particular project. Our resident expert, Erica Bitterman-Ryon will be presenting these informative talks. 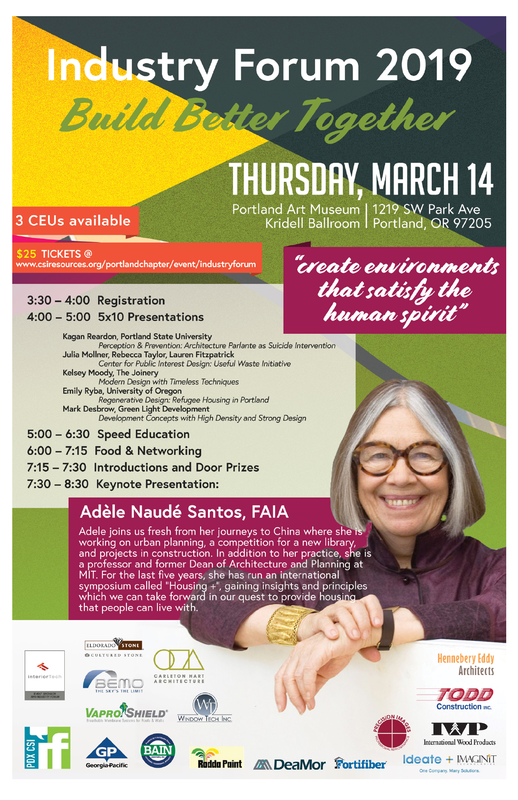 Keynote speaker will be Adele Naude Santos, FAIA. 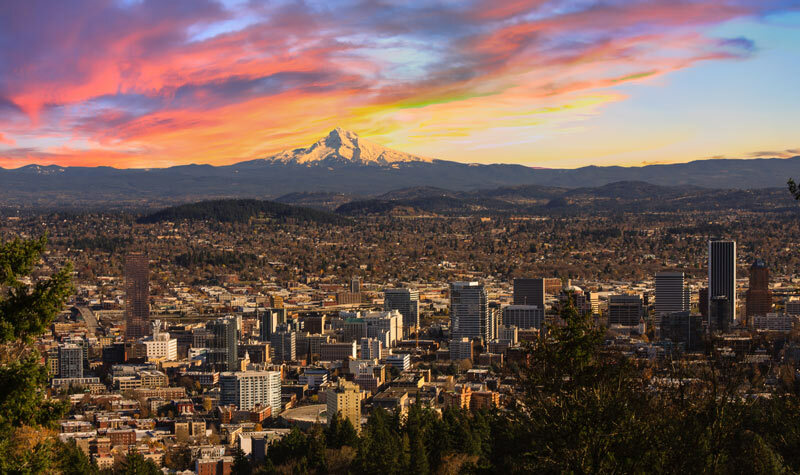 This year’s Industry Forum will be held at the Portland Art Museum’s Kridell Ballroom on Thursday, March 14th, 3:30 to 8:30 pm. 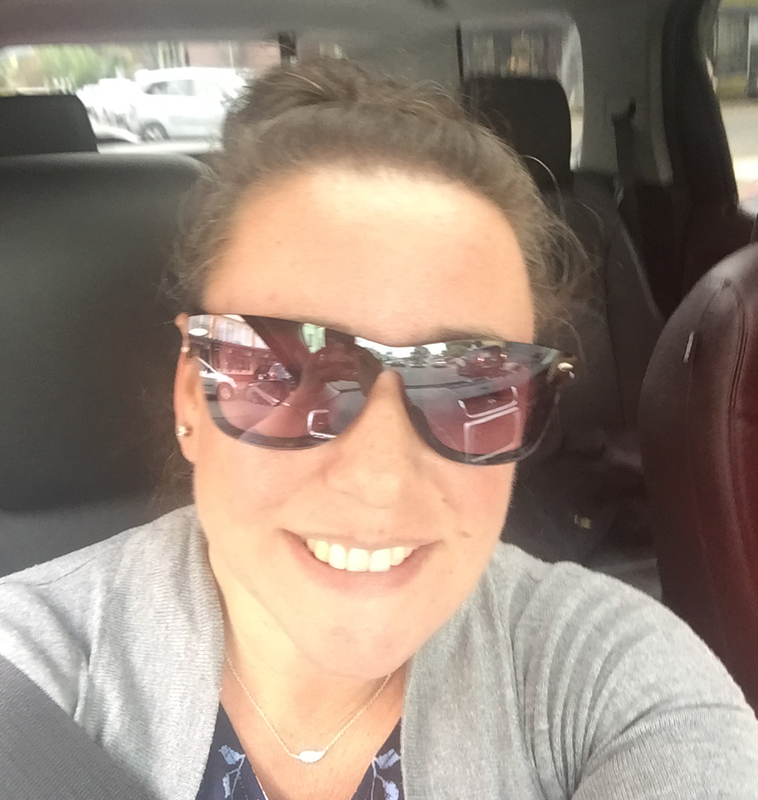 Meet Erica, Our Senior Sales Executive – She’s Pure Sunshine! 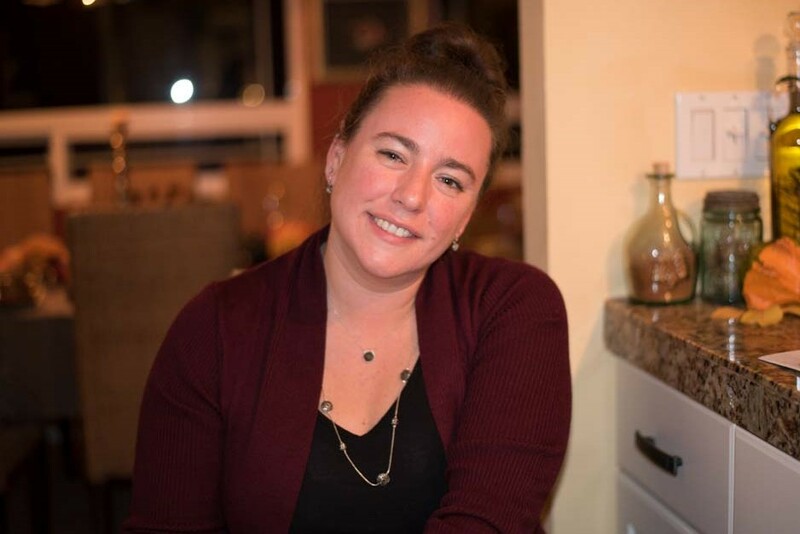 Our first spotlight feature celebrates Erica Bitterman-Ryon, she is our Senior Sales Executive, and has worked at PI since she was a kid. Her father Don was one of the co-founders of Precision Images, so it’s in her blood and in her soul. She may in fact be the greatest sales person who ever lived, as there is no task too tough, no demand too crazy, Erica WILL make it happen, and she remains contagiously cheerful through it all! I am the person that helps you find the service for your project. Here to help when you’re down to the wire and need fast and beautiful results. Your Trusted Advisor. I was hired back in May of 1995. Don, one of the founders and my father, knew I disliked my current office manager job. He offered me the position of front counter, receptionist, and project manager. But it was supposed to be for 6 months till I found another office manager job. I never left. It will be 24 years this May. I moved into Sales late 1997. Favorite thing about or memory of working at PI? My clients, and no, I am not being cheesy. I love the people I get to work with. I don’t just have clients, I have a lot of friends and many mentors that have helped me along the way and are always willing to explain things to me. Never once made me feel like I was asking a stupid question. I just wanted to understand more so I could do my job better for them. Favorite Memory is tough, I have some projects I got to help with in my start that I have never forgotten, like the Washington County Justice complex. First big job I was put in charge of. D.A. 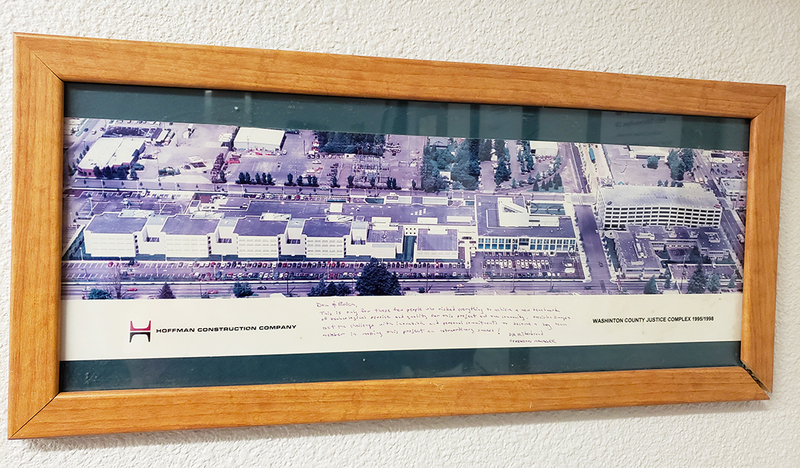 Hilderbrand gave me an aerial picture of the site when completed and 20 years later I still have it hanging on my wall with his wonderful words to me. There is also my time spent with “CSI” Construction Specification Institute. They have honored me many times with the work I have done in my 20 years with them. Getting the Al Hanson Award which is the top award for a chapter, was huge for me, and this year I was honored to be elected at the NW Region President Elect. They have mentored me and helped me along in my career and I am forever grateful. Ya know, no I haven’t. I thought I would, I was nervous about that at first, with a little chip on the shoulder prepared for issues. But that chip went away very fast. I have always been treated with the utmost respect and have never been made to feel like I wasn’t welcomed or that it was boys only club. A lot of that though Is my personality, I don’t intimidate easily or get my feather ruffled. I am always smiling and happy. Life is too short to grumpy and walk around with a chip. The printing industry is like no other, we have changed and evolved so many times over the years and will continue to do so. Looking for new services and products for our clients. It isn’t just copies. We are not Kinkos. We get to be involved in a little piece of someone’s artwork that they are leaving behind for generation as their legacy, it is part of our legacy too. I never thought the industry would change as it did. Pushing blue prints was far easier, I do miss my purple thumbs and that smell. But now things are faster and more colorful, and technology advancements change us so quickly. It is staying ahead of it and not getting lost. I never thought I would be doing site walks and doing these colorful graphics on buildings and for trade shows. It was easier 20 years ago, I have a lot more I need to learn and research, but with all that, this is far more exciting and allows me to be more creative than ever before, now I am part of the team discussing what materials are best and the logistics of things. With blue prints you don’t get to do that. Excited and overwhelmed at the same time. Excited for the projects I have yet to work on and be involved with. Overwhelmed with keeping up with new materials and processes and learning all I can about them. Tell us about you, what is your Favorite food? Favorite band or music? Favorite movie? Favorite book? Fav food that is tough, I love Italian, lobster raviolis. BUT I spent a week in New Orleans and grew to love the food there: Alligator, Boudin, catfish and Beignets, OH MY! And so much more. Favorite band/music is an easy one, everyone knows I am obsessed with Fleetwood Mac and Stevie Nicks. Favorite movie is tough too, I grew up watching Godzilla movies and the old hammer film monster movies and still love them to this day. For current movies, I am so not the chick flick movie gal, it would be the Marvel movies and John Wick. Favorite book, I am an Anne Rice fan of the Vampires, Witches, Mummy and Werewolves. I also have a signed copy of “Midnight in the Garden of Good and Evil”, after reading that book I had to go to Savannah Georgia to see the place for myself! There you have it, a glimpse into the world of Erica Bitterman-Ryon, our sales tour-de-force and the sunshine of Precision Images. Her cheerful laughter keeps everyone here smiling throughout the day, and her industry knowledge makes her a highly trusted partner for any project. Stay tuned next week when we highlight another amazing woman here at Precision Images. Big News! We’re Launching A New Customer Portal Soon! A new Portal? What Does That Mean? For more than a decade, our trusty “Send Us Files” Customer Portal has gotten your jobs to us quickly and efficiently. There was a time when Precision’s “Send Us Files” portal, or “Portal 1”, as we endearingly refer to it, was cutting edge. In fact, it inspired many of the customer portals used across the country by other printers. But, as we all know, technology continues to move at a startling pace, and sadly, Portal 1’s day has come. In the next few months, Precision Images will be launching “Portal 2” (Yes, we know we need to work on that name, and are open to suggestions). “Portal 2” will offer a more attractive, modern look and added capabilities, for example, the ability to update any details and/or files of your order up until the exact time our Production folks start on the order. Once production starts, you will still have the ability to send revised files and revised instructions via the same order if needed. 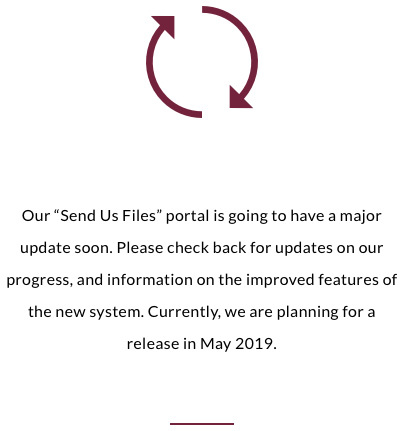 We’ve done our best to keep the look and feel of the old “Send Us Files” Portal, and hopefully minimize any extra stress in your day. You’ll be hearing more about this upcoming launch in the next few weeks, and soon we’ll have some Beta testers trying it out in the field. One important fact to note, all existing users will need to reset their password in “Portal 2”. Once reset, your email and basic address information should be in “Portal 2” waiting for you. Sorry, for that minor inconvenience, but we think you’ll agree the new ease of use, added security, and modern look is worth it. We understand that change can be difficult, but we know once you get settled in, you will love “Portal 2” as much or more than you loved “Portal 1”. Thanks in advance for your patience as we put “Portal 2” into place. Here’s a sneak peak of the new Portal 2 login screen!